Discover the Propulse 430 trampoline: Made by France trampoline, it is specially designed for local authorities and the leisure establishments that have high visitor numbers. This octagonal model is designed for leisure professionals. The trampoline constitutes a long-term investment and will offer certain fun and satisfaction to all ages. 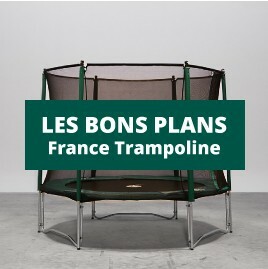 France Trampoline design and build specifically for our professional clients! This trampoline is equipped with a netting safety enclosure, the supporting poles have one of the largest diameters on the market. At the top of the posts and netting is a circle of steel rods to support the structure and allow years of safe use. The door of the enclosure locks outside and in, securable with padlock to avoid unauthorised out of hours use. The frame is made from hot dip galvanised steel, offering an excellent resistance to the elements. The numerous springs on this trampoline model assure a powerful bounce. Thanks to our unique type of “T joints” the trampoline can support up to 120kg. Propulse TrampolineThere is 1 product.